The Perfect Diet Tracker download should start automatically in the next few seconds. If it does not, click here to restart the download. Your browser should start the download automatically. If it does not, use the link at the top of this page to restart the download. Before you can install the software you will be asked to review the user license agreement, then click the 'Agree' button to continue. 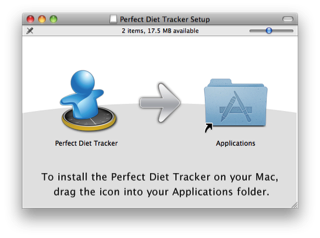 To complete the installation drag the Perfect Diet Tracker icon into your Applications folder. To start your free trial go to your applications folder and double click on the Perfect Diet Tracker icon. The software will then start and take you through the steps needed to set up a new user. Need any more help? Check our our support section. To start your free trial simply click on the download button below for the type of computer you are using (Windows, Mac or Linux). The download will then start and you will be shown instructions on how to install the Perfect Diet Tracker and start your free seven day trial. The current version for all platforms is Perfect Diet Tracker version 3.7.4. The free trial starts when you install the Perfect Diet Tracker software and use it for the first time. If you are intending starting your diet at a later date we recommend you download the free trial now and then run the installer when you are ready to start your diet to ensure you get a full 7 day trial of the software. Unfortunately we are unable to extend the free trial period. When you reach the end of the trial the software will lock and you can choose to buy a license to unlock and continue to use the software, or simply delete it from your computer. Does the trial download contain any other software? 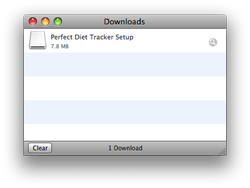 No, the download only contains the Perfect Diet Tracker software. No spyware, no adware, no toolbars and no viruses. This is certified independently by Softpedia and Download.com. How long will the diet tracking software take to download? We have high performance servers so if you have a 'broadband' connection the download should complete in under a minute. Even with a slower connection the download should still complete in just a few minutes. All versions of the Perfect Diet Tracker have have identical features. If you swap from one platform to another you will be able to use the software just as you did on the original platform. . The unrestricted free trial will work for 7 days. There are no functional restrictions in the trial, you get access to all the features in the software. What is the difference between diet software and a diet application? There is no difference, traditionally applications you install on your computer were referred to as computer software. Recently with the advent on mobile devices, the term application or 'App' has become more popular. The Perfect Diet Tracker can be referred to as diet software or a diet app. Can I download an older or beta version of the app? We always recommend all users use the latest version of the Perfect Diet Tracker to gain access to the latest features and current product databases, however we appreciate some users may need to reinstall older versions for compatibility reasons or like to try the latest cutting edge version. View all versions of the Perfect Diet Tracker available for download. Please check our support for more answers to common questions, or to contact us.